American downhill veteran Steven Nyman knows the value of training in these facilities. Even for America's fastest skiers, securing a spot on the U.S. Olympic team is always an uphill battle. No one knows that better than veteran downhiller Steven Nyman. The 35-year-old Utah native managed to secure a spot after coming back from a devastating knee injury sustained in a crash in Germany last season. But on Jan. 26 — just two weeks before the start of the games in Pyeongchang, South Korea — Nyman's Olympic dreams were dashed anew when he injured his other knee during a training run in Germany. Nyman expects to be racing again next season and has his sights set on the 2019 World Championships in Sweden. To get there, he knows he'll have to work hard and make use of all the training tools at his disposal. And like many elite skiers, he knows that training in a wind tunnel is a great way to hone his form and cut precious seconds off his times — without risk of injury. Wind tunnels essentially simulate racing conditions. 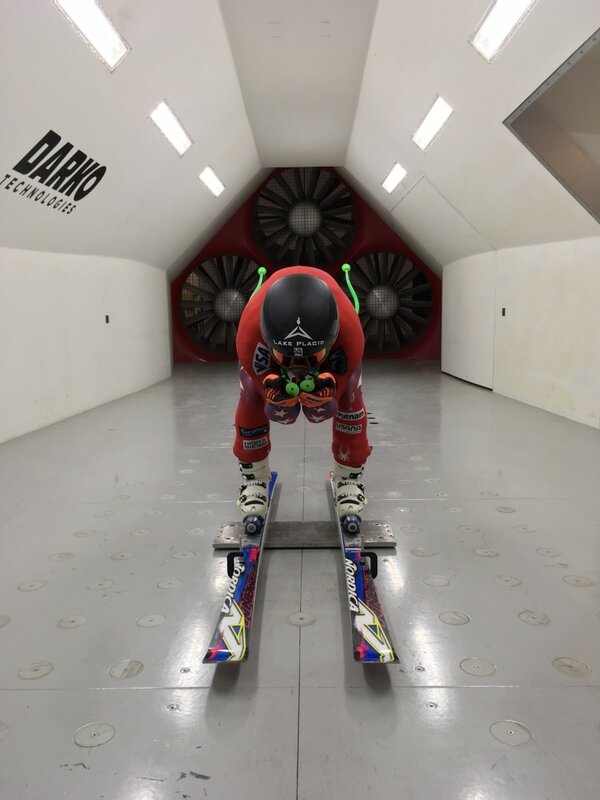 “To replicate the aerodynamic effects on a skier, the wind tunnel pulls the air past the skier at the same speed as he would be traveling down a hill,” says Layne Christensen, founder of the Darko Wind Tunnel in Ogden, Utah. After last year's injury, Nyman trained repeatedly in wind tunnels, including in Christensen's facility. Alpine skiers can reach speeds of 90 miles per hour as they fly down the face of an icy mountain, propped up by nothing more than a pair of six-foot-long fiberglass planks. Wind resistance is every skier’s enemy, and finding a way to reduce it can make the difference between finishing on the podium and walking away empty-handed. "The difference between first and fourth place can be less than two-tenths of a second," says Troy Taylor, high performance director for the U.S. Ski and Snowboard Association. In essence, the tunnels become laboratories in which athletes and their coaches can experiment repeatedly to build a “vocabulary” of aerodynamically optimized body positions that the skiers can later use to negotiate mountain courses at high speed. The data generated by tunnel facilities are reported to the athlete in real time, so he or she can tweak their position on the fly. "You’re holding that small tucked position in a wind tunnel for five minutes at a time, so your legs are burning,” Nyman says. "The wind is tearing through you, so you get dry in the mouth." But he knows it's a crucial way to unlock the tiny aerodynamic gains that yield big improvements in his downhill times. A male World Cup skier might generate 30 to 31 pounds of drag; female skiers might pull 22 to 26 pounds. Smaller drag measurements mean less wind resistance, and the general rule is that a reduction of 0.2 pound of drag can increase a skier's top speed by about 0.98 mile per hour. Nyman won't be racing in Pyeongchang, but he's not about to give up. “I was really looking forward to not only representing our country at my fourth Olympics but trying to contend for a medal,” Nyman said in a written statement. “The good news is that this injury is much more straightforward than last year, and will be much easier to come back from."